To us who are long time members of the Gotheborg Discussion Board, it is especially comforting to among the acknowledgments find that our Tim Hartill has provided the bulk of the ceramic related research that this book references. Since this is a collected shipwreck where all pieces dates to more or less the same period it gives important information on which shapes and decoration that actually was made at the same time. And on this point it seems that the porelain history needs to be rewritten in some no small matters. This is no doubt one of the best books ever written about kraak porcelain and will become an important standard reference. “The maritime archeology of Sten Sjöstrand has led to major advances in the study of Asian trade and trade ceramics in Southeast Asia. His meticulous documentation of a series of nine shipwrecks from the 11th to 19th centuries reveals the early dominance of Chinese trade ceramics, a subsequent loss of the Chinese monopoly in the late 14th century when Southeast Asian ceramics entered the market, the basic parameters of the Ming gap shortages of the 14th-15th centuries, and a resurgence of Chinese wares in the 16th and 17th centuries. A lifetime’s experience with the sea and sailing allows Sjöstrand to bring new understanding to ancient ship construction, and his voluminous reading allows him to set the ships and their cargoes in historical perspective. This publication delivers the sort of precise data that will stand the test of time and be mined by future scholars for studies to come on Asian history. The thoroughness displayed in this catalogue is a testament to his passion and devotion to mapping ancient maritime trade and trade goods during more than two decades of dedicated work”. The book is very nice and really high recommended. The quality of the book with hard cover is of high standard, all the 360 pages of paper and real nice print. I have the book and count 700 pictures and all in color, also there are a hundred drawings of rim decoration add and several marks used in that period. Almost all the porcelain (ceramic) is of blue and white, and it gives a good indication what kind of decorations there was in that time, in and just after the Wanli period, around the year 1625 and every object has a own description. 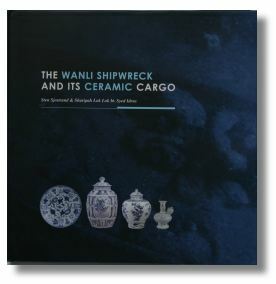 The book gives beside the excavation of the Wanli shipwreck and the porcelain information an important part about archeological and historical background of ceramic production.